Lost Vegas online slot – free spins and bonus games! Get ready for the apocalypse; Las Vegas is crawling with zombies and survivors who are ready to fight for the town in the Lost Vegas Online Slot. Try this thrilling game that can be played on either Desktop or mobile devices, at any of the Microgaming Casinos, and find out where your fate lies. When you explore this exciting game, you will be taken through some of the post popular Las Vegas locations caught in the aftermath of the zombie apocalypse. One of the amazing features of the game is where you can change sides, and choose to play as a zombie or survivor anytime during the base game. 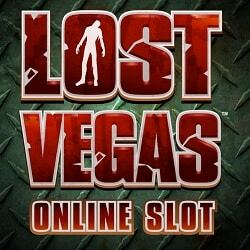 Lost Vegas has 5×3 reels, 243 Ways-To-Win, 2 base game features, 2 Free Spins features, multiple languages and platforms supported, a special Blackout feature and a Zombie Fist of Cash feature. Both base games have their own bonus, they include separate Free Spins features and the game mode can only be switched in the base game. When you land 3 or more Scatter symbols on any of the game modes, you will be awarded with Free Spins. Free Spins can’t be retriggered and all bets played are the same as the bet that triggered the feature. Free Spins are triggered with the Stash feature. The Low symbols are snatched off the reels for cash prizes. The fewer lower symbols on the reels increases the Survivor win potential. All of the winning combinations will repay after each interation of the Survivor Stash feature play out. The Free Spins feature continues until all the low symbols have been stashed. To trigger the Zombie Free Spins, you will have be play in the Zombie mode in the base game. These Free Spins will be triggered with the Infection feature. A full Zombie symbol stack landing on reel infects that reel for the remainder of the feature. The Infected reels turn single Wilds into Stacked Wilds. When you survive 50 Free Spins, you will win additional prizes. The Free Spins will end when all the 5 reels are infected, or when all 50 Free Spins are reached. This exciting feature can appear in the base game on any non-winning spin. The Zombie Fist of Cash also awards a random cash prize. This feature activates on any non-winning spin in the base game. The reels will be scanned and high symbols are revealed. Each high symbol in this feature awards a random cash prize. When you land one scatter symbol anywhere on the reels, it will trigger Free Spins. Lost Vegas will keep you entertained throughout as you and cling on to your seat in anticipation of whether Las Vegas will be taken over by the living dead as you race up winnings of up to 970,000 coins!